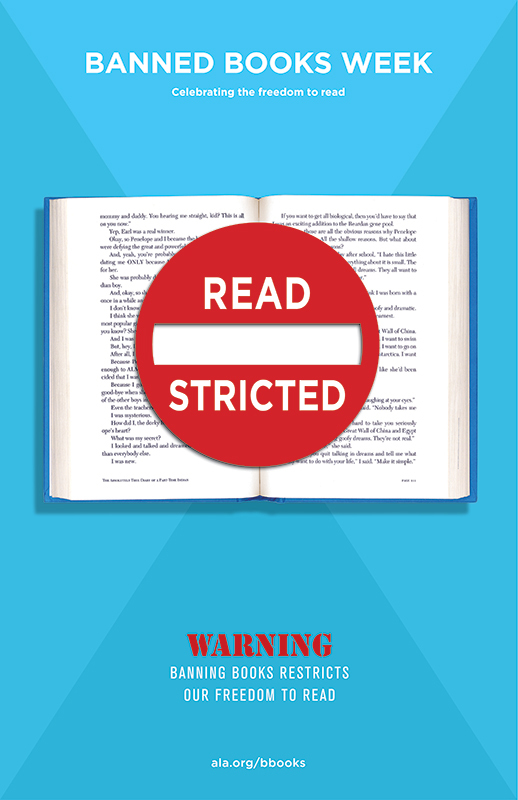 This is Banned Books Week (September 27 to October 3). Schools, libraries, and booksellers are proclaiming the evil of attempts to ban books, publishing lists of the top banned books of the past year (here is one), and featuring these books prominently for lending or buying. Please understand: I think attempts to ban access to any books are both unconstitutional and stupid. Unconstitutional because of the First Amendment, which provides broad protections of speech, even speech which is offensive. Many call this our First Freedom and for good reason. It’s also stupid. Nearly all challenges to books fail, and only spotlight the very books people are trying to ban. It strikes me that attempts to ban books take the focus off the quality of the book and make the author something of a “martyr” and give the book the allure of forbidden fruit. But I have some questions about the “banned books” phenomenon, which strikes me as “the outrage of the week”. Is this really the big deal it is made out to be? In 2014, there were 311 reported challenges of books. That is less than 1 challenge for each million people in this country and only a bit over 6 per state. Yes it could be argued that any challenges are too many but is this really a big deal? How many books are actually “banned” in the US? I am unable to find statistics on this. The American Library Association’s Banned Books website indicates that “most” challenges are unsuccessful and most materials remain accessible. At very least, it might be more honest to call this week “Challenged Books Week” because I suspect that is mostly what it is–although I understand the alliteration and rhetorical value of the term “banned”. It is striking to me that a number of the “challenges” are by parents to school curriculum. I would observe that curriculum may be distinguished from libraries in public discussion. Curriculum is what students must read, study, and intellectually engage to accomplish educational objectives. Every curriculum includes–and excludes–certain materials based on these educational objectives and this is not regarded as censorship because those materials excluded are still accessible in libraries or via booksellers. Parents, whose taxes or tuition support the schools, are stakeholders in these decisions, along with educators, and local and state boards of education. Are all questions by parents about the educational merits of books to be labeled as “censorship”–particularly if the effort does not seek to ban access to the book in question in school or public libraries? Access implies choice of what one will read. Curriculum is generally mandated, with some opportunities for “opt outs” or “alternatives”–a very different thing. I would argue all attempts to challenge and ban books in libraries are wrong. Period. But I would also observe the librarians make decisions about the acquisition of materials and the suitability of materials, particularly for children. In acquiring materials, I suspect librarians weigh a combination of factors including community preferences as well as some basic values that probably result in excluding materials that are blatantly racist, intolerant, or simply represent inferior aesthetic or intellectual value. There is only so much “shelf space” in any library. Are the librarians themselves using their institutional power to “ban” books in what they decide not to acquire? Most of us would say “no” but this argues for a legitimate form of discrimination in selecting what librarians deem the “best” books for their clientele. Finally, I wonder if both those who attempt to ban books, as well as those who vehemently defend them divert us from the more important discussion, which is an assessment of the quality of a given work. And I suspect that in the “banned” lists there are both works of great artistic excellence and those which time will judge as mediocre.